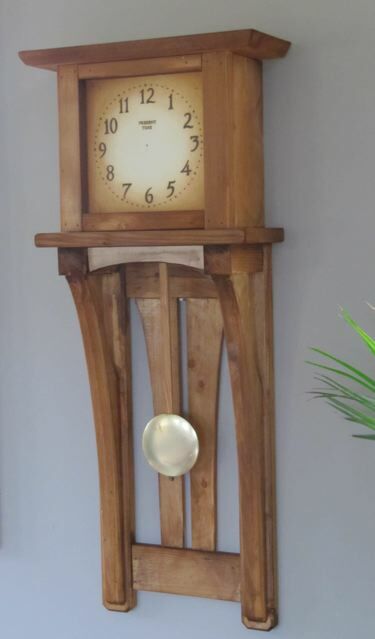 I am a woodworker and I make clocks. 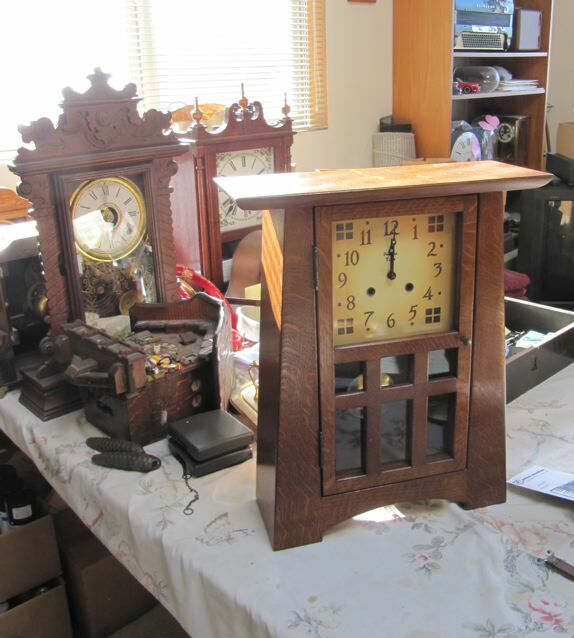 However I am not really a “clock maker.” I have been inspired the designs of clocks from a century ago and have somehow built a business around making clocks “in the present time” meaning I use materials and technology of the time in which I live. Most of the clocks I make use quartz movements – the most accurate, reliable and cost effective time keeping mechanism available today. 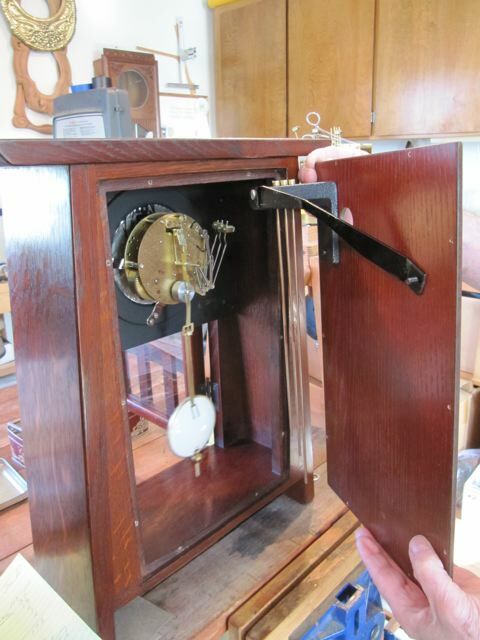 Ever since I started making clocks over 18 years ago I have been aware of the lure of the mechanical movement. 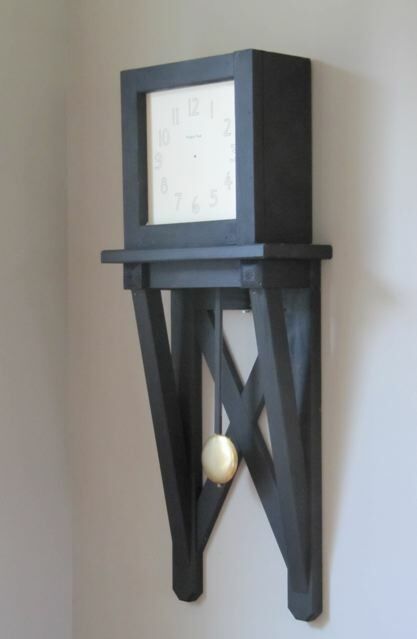 Clocks made during the early 1900’s are the design inspiration for my work and would have then been built around a small brass “movement”, a marvel of state of the art technology from 100 years ago. If logic held out over passion, the mechanical movement would have died out decades ago with such contraptions as the adding machine and typewriter as digital clocks and electronic calculators can do the job for 1/100th the cost. But there is the passion, the fascination and the nostalgic tug of the mechanical movement. 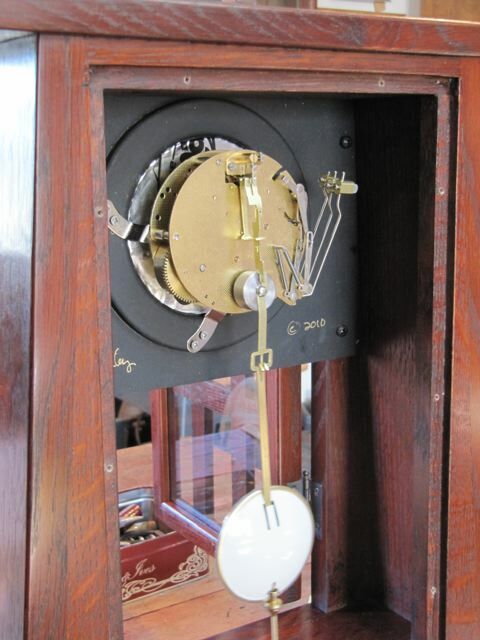 Most everyone has a recollection or fond memory of the sound of a mechanical clock in their past. 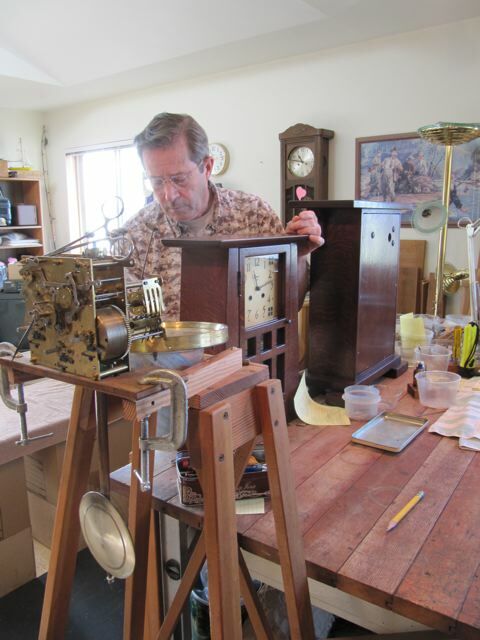 Cherished clocks that perhaps used to belong to grandparents are lovingly kept alive by the rare, and possibly dwindling of craftsman, the clock repairman. This Arroyo Seco was the first clock we did, or I should say he did. 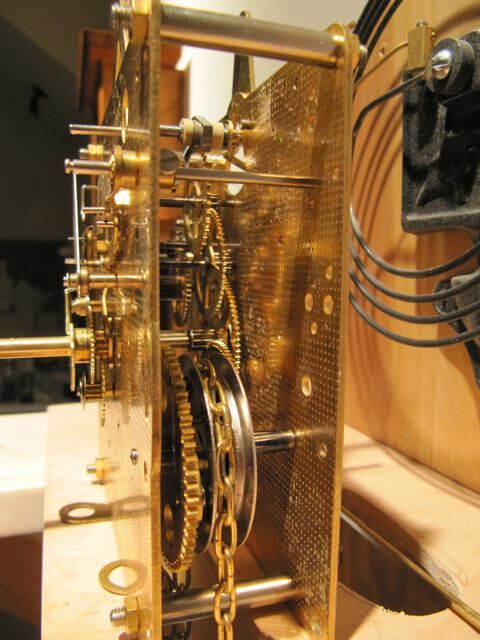 Essentially he adapted a mechanical movement to the case I had already designed and built. In the present day the number of companies that make quality mechanical movements is dwindling. Ron was able to find a German made Hermle movement that would fit the size of my cabinet and wouldn’t require too much modification. 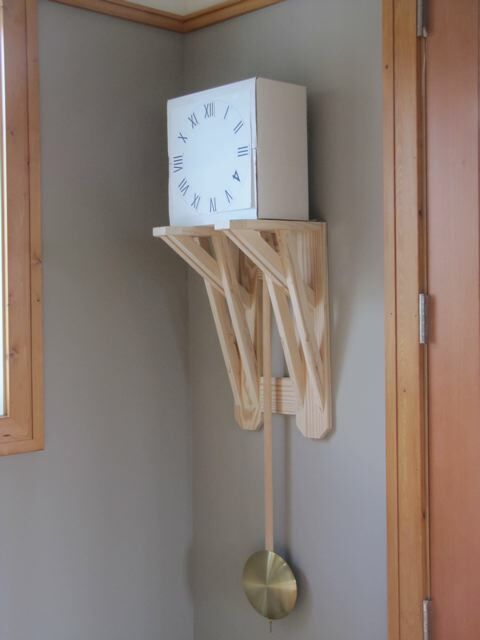 Physical requirements such as pendulum length meet design elements such as where the pendulum bob appears in the window on the face of the clock. To make it work in my cabinet Ron takes apart the movement and changes the gearing to accommodate a shorter pendulum. He has thus earned the title “clock genius” in my book. In this installation Ron has added a weight to the pendulum shaft (note silver disk on the suspension rod) this corrects the speed of the pendulum so it can be the proper length, and thus be in “just the right spot” in the window when seen from the front. The silvery foil between the dial and the movement is sound insulation to keep the noise of the gears on the mechanism to a minimum. The chime mechanism is another element of the design that require a great deal of knowledge gained from experience. The best sound comes when the brass rods, screwed tightly into a cast iron base, are mounted to a thin “sound board” much like the top of a guitar. Given his musician background, Ron does not settle for using the standard short rods that come with the movement, but cuts and tunes his own longer rods to give a deeper, truly handmade sound. No two clocks ever sound the same. 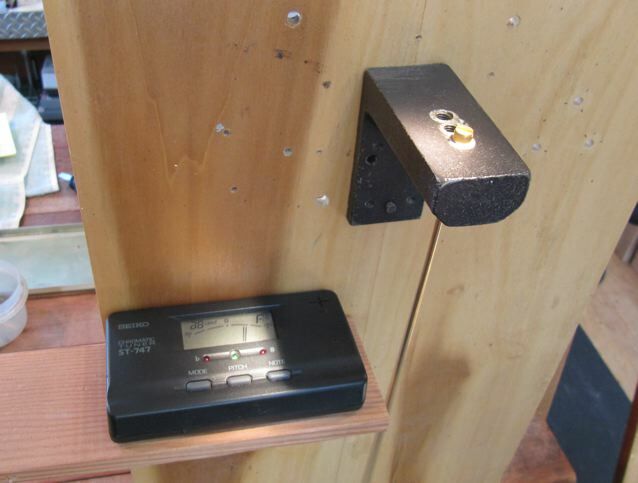 This is an electronic tuning device used to get the perfect pitch. The note changes subtly by carefully grinding down the length of the rod. After at least a week of adjusting and calibrating, the clock is ready for it’s new home. 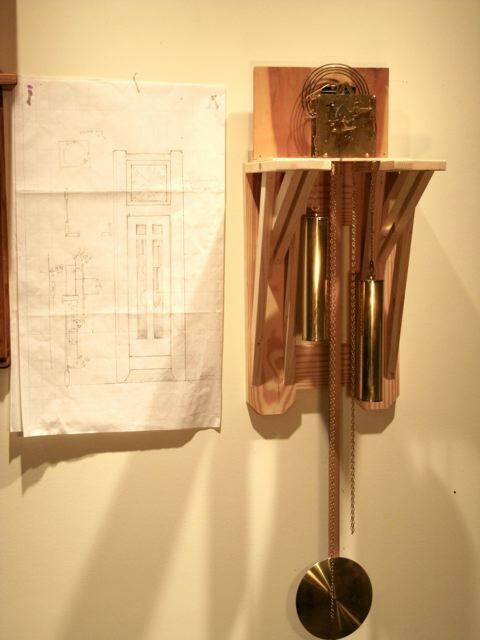 Since I have moved to my larger space a year ago I have been working toward creating the larger scale mechanical grandfather clock. I knew this was going to take some time and figuring out. I don’t want to just make a big cabinet and hand it over to Ron. Ron gave me the mechanical components to work with earlier this summer and I have been slowly getting familiar with this seemingly Rube Goldbergian contraption, and figuring out how I can design a cabinet around it. I am fascinated with the look of the mechanical parts, and have been drawing inspiration from them. 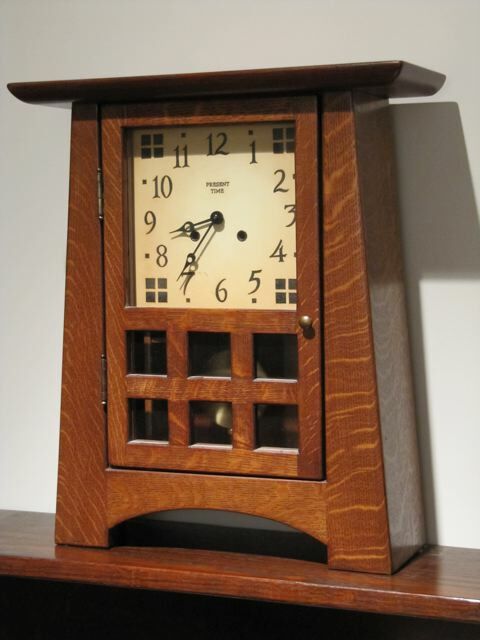 Early Arts & Crafts clocks embrace this element by exposing the functioning parts of the clock and making it part of the design. I love the weight and chain driven movement and want to start with a large scale wall clock design with exposed elements. Earlier this year I made this shelf bracket originally not thinking of it as part of a clock design at all. When Ron brought the parts over I did some playing around with the pendulum and a cardboard box and came up with this. There’s something provocative about this to me. It has become a shelf for holding the movement and has inspired some new designs. These are some simple pine mock-ups that are some variations inspired by this design idea. stay tuned for further developments . . . . This entry was posted on Saturday, November 13th, 2010 at 7:46 pm	and is filed under Uncategorized. You can follow any responses to this entry through the RSS 2.0 feed. You can leave a response, or trackback from your own site.